Description - Have an outdoor deck or patio and are tired of refinishing it every year? 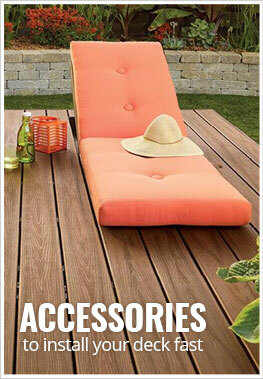 Replace that natural wood decking with Trex Select – Square Edged decking boards. Resistant to rot, staining, fading, and mold, these composite deck boards are the perfect 'Green' alternative to natural wood decking. Installed the same way as natural wood decks, these deck boards are perfect in any environment. Backed by a 25-year warranty, these deck boards are virtually maintenance free. Weight – 12' boards are 39 lbs., 16' boards are 52' lbs., and 20' boards are 65 lbs. Recommended Uses – Trex Select grooved edge decking boards are the perfect decking solution for any part of the country. Resistant to rot, mold, staining and fading, these deck boards have been installed as outdoor patio decking, outdoor deck flooring and much more. Stain, rot, fade and mold resistant.